Long before the chicken became the country’s favourite fowl for the dinner table, there was the duck. The Chinese domesticated it 4000 years ago and it is still their meat of choice. The Egyptians were not too far behind the Chinese; they captured eggs that were hanging about in nests amongst the reeds on the banks of the Nile. The duck truely is the “veteran of the henhouse”. Britain too did love its roast duck, though duck breeding did suffer greatly during the World Wars and never really recovered. All farmed ducks today are all descended from the seemingly ubiquitous mallard. Farmed ducks and mallards differ greatly in size: farmed ducks are commonly double the size of their wild cousins and are often seen capturing and eating whole frogs in a single bite! Prior to domestication, many of the duck species that were caught and eaten were migratory, coming and going like clockwork as the seasons passed. Heavy symbolism was therefore attached to the eating of them, and they were integrated into feasts. They are still eaten in Romania at the vernal equinox. In Britain, the most well-known duck breeds are the Aylesbury and Gressingham, though they are by no means the most common. Many breeds dwindled in number so much that they went extinct, though some have been saved, such as the Silver Appleyard. The most common ducks that are reared for the table these days are the Pekin and Barbary ducks; the latter of the two must be rather stealthy as it is very common to see escapees hanging around ponds in Britain (and indeed the USA). When people think of British ducks, they think of the Aylesbury – with their gleaming white plumage, orange legs and feet and sturdy bill set high upon their skull. Even if one did not know of the Aylesbury duck, I am sure that this is the picture one would have in their head. 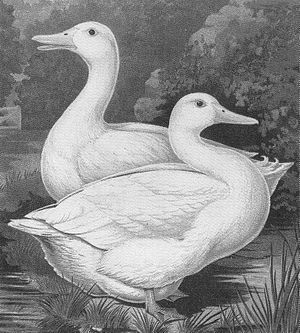 Beatrix Potter’s Jemima Puddle-Duck was an Aylesbury for example (though she lived up North). Aylesbury ducks were not originally bred for their meat at all, but for their quills. In the nineteenth century, however, the switch was made. The reason being the folk of Aylesbury saw an opportunity to feed the ever-growing London population. Selling was successful – it must have been quite a sight to see the drovers walking the ducks from Aylesbury to London every week to be sold at market. This seems all very picturesque, but in reality it was far from it. 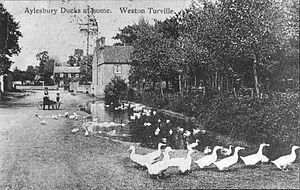 The ‘Duck End’ area of Aylesbury, where the ducks were bred was unsanitary, ducks were not kept in farms but were allowed to roam free, and taken into people’s homes at nighttime. However, Aylesbury’s attraction endured and conditions were better by the twentieth century. Then came The Great War, which damaged duck farming greatly and World War Two almost wiped it out completely. By the 1950s, there was just one significant flock of Aylesburys left and by 1966 there was no more breeding of Aylesbury ducks. Birds were often sold under the name Aylesbury, but they did not ‘contain a single Aylesbury gene’. It is not all bad news though: some individuals did remain, though most had cross-bred with mallards. However, there was a large effort to bring back the breed and so the small mongrel population was selectively bred and we now have Aylesbury ducks once more. Of course if you’d been cooking “Good Things” instead of English Food you’d have long since enjoyed The Hermit of Gower’s Salt Duck. Salted and rinsed duck recipes and duck baked in a salt crust are both pretty common way back when – try the salt crust some time. And don’t forget that most .ducks were not as fat as they are nowadays. I do love your stories, Kathryn!